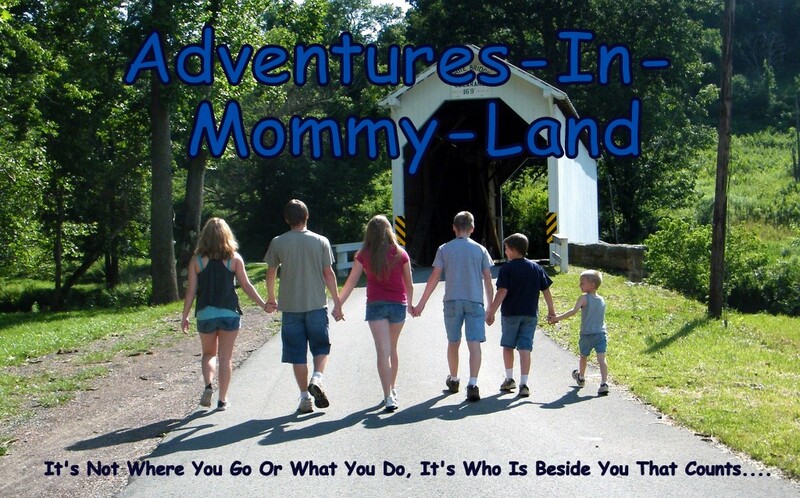 Introducing.......Kim - She's a homeschooling mother of nine and author of the blog and book Large Family Logistics. And that's what makes her a great Mom That Blogs! Tell us a bit about yourself.......My husband is Matt. We farm in south-east Iowa. He also works full time for a seed corn company. Our children are Brandt (20), Brock (18), Bridgette (15), BriAnne (13), Brook (11), Brian (9), Bronwyn (7), Brielle (5), Matthew (4). We work hard and play hard. My kids are free-range here on the farm. It’s all a big learning experience. We really get into 4-H projects. In the winter we do our bookwork. Name 3 fun facts about yourself, that may surprise us......I live a mile north of my folks and two miles west of my inlaws. My husband and I grew up across the section from each other but never knew each other until we were 18 and 21. We met working for a seed corn company. I don’t like to watch movies very often and if I do watch a movie, it had better have really good reviews. I think that being a storm chaser would be fun. I like to watch the clouds and storms. What is your blog about......Originally it was about managing the large family home. Now, I write stories that happen to us or have happened in our family life. I do reviews. Sometimes my opinions on things come out in a post. I answer questions that come into my email. I don’t write as often as I should. I used to write every day but Sunday and that brings in lots of readers. Now, I write once or twice a month, maybe. My kids are older and that is a different kind of busy. It’s a lot of talking and thinking and being their guidance/career counselor. It’s looking at what they’ve been doing and their strong points and helping them see other ways and points of view. It’s exhausting in a different way. It also requires praying all the time. The home management doesn’t require a lot of thinking anymore but guiding the older children certainly does. An older mom told me recently that a good question to ask older children or adult children is “How does this fit your worldview?” Everything centers around a person’s worldview. Why do you blog.......It’s a good outlet for family stories and photos for family and friends. It’s good for large family mamas to learn how other people do things, it’s always good to hear a different way. Reviews are great because you discover new and helpful products or learn to steer clear of a product. Speaking of large families, what inspired you to write the book and when did you find the time.......I kept a journal where I wrote things that I did to make life with a bunch of little kids easier. I was learning everything the hard way, reading home management books, quizzing older ladies, and experimenting with different systems. I liked the idea of FlyLady and the emails that she sent out telling the reader what to do but it didn’t quite fit my life and lifestyle. So I set up a similar system in yahoo groups that suited me and other large homeschooling families and sent out a notice in a couple of groups I was a member of including the MOMYS email group. Moms were excited about it and wanted me to fill in the gaps with instruction so I started writing a blog. This was all back in the winter of 2004-2005. I have lots of memories of typing with one hand while holding a baby with the other. I’m pretty good at typing left hand only and right hand only. J The blog took on a life of its own with moms asking questions and me answering how I do this, that and the other. All those years of studying, asking, reading, and the systems that I developed from that came pouring out of my fingers onto the blog site. So first it was my girls that inspired me and then it was the other moms that were struggling that inspired me to organize my writing into a book. I wrote it in the early morning in little bits. Organizing it and editing were the hardest parts. I set aside large blocks of time and did a lot of planning ahead and organizing so that I could sit down for more extended periods. I don’t sit down very well. I do a lot of writing in my head while I’m working at other things and then when I do sit down it comes out pretty fast. Editing—not so much fun. What inspires you.......God’s Word inspires me to live more fully in Christ. To know Him and to make Him known. My family inspires me to create a beautiful life for all of us. Do you have a bucket list? If so, Name a few things on it.......I want to hike a portion of the Appalachian Trail. I want to canoe in the Boundary Waters. I want to learn how to make a good bread in our wood fired brick oven (so far we just do pizza). I want to be a quilter someday when I have more time. Do you read other blogs.......I don’t. I’m too busy with my family and our farm these days. I used to read a handful regularly. Those were: A Holy Experience by Ann Voskamp, Life in a Shoe by Kim Coghlan, Amy’s Humble Musings by Amy Scott, Spunky Homeschool by Karen Braun, Preschoolers and Peace by Kendra Fletcher, Buried Treasure by Carmon Friedrich, and LAF. When I do read blogs on quiet days, I go back to these old favorites which sometimes lead me on rabbit trails to other blogs. I love these blogs because they inspire me in my home and family life, make me think, make me cry and make me laugh. Do you have any blogging advice that you would like to share.......Write with a purpose. Don’t let it, or the computer, supersede the relationships you have with your family. 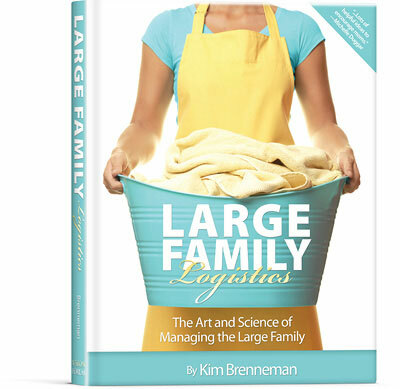 You can read more about Kim by checking out her blog .... Large Family Logistics. She shares lots of tips for cleaning and laundry and yummy recipes. Her book is available through Vision Forum and Amazon.